A new project for Wiki4MediaFreedom - the initiative launched by OBCT in 2015 as part of the European Center for Press and Media Freedom, with the aim of curating content on media freedom issues on Wikipedia, the largest free online encyclopedia and the first daily reference point for millions of users all over the world. Over almost three years, we have built a sort of “European encyclopedia of press freedom”, creating and refining dozens of entries on media systems, transparency of media ownership, censorship and self-censorship, access to information, independent media and other actors who work for freedom of the press and pluralism throughout Europe, and in particular in South-eastern Europe, the Visegrád countries, the Baltic countries, in Turkey and in the Eastern Partnership. 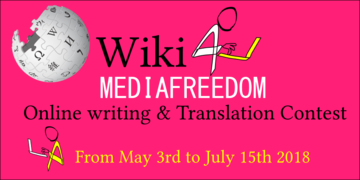 All the Wikipedia articles created within the initiative Wiki4MediaFreedom are available also on the Media Freedom Resource Centre .